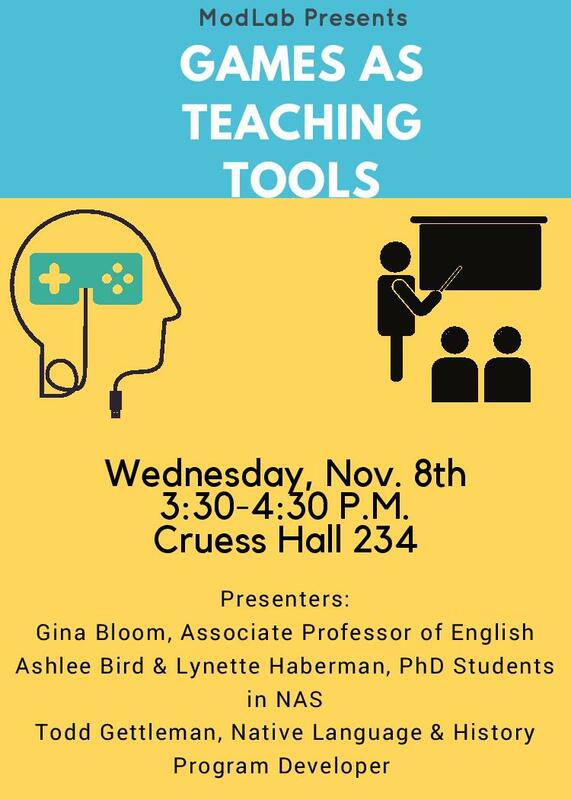 The ModLab will be hosting a workshop on “Games as Teaching Tools” in 234 Cruess on Wednesday, November 8th at 3:30p.m. In this workshop, Prof. Gina Bloom, NAS grad students Ashlee Bird and Lynette Haberman, and Native Language and History Program Developer, Todd Gettleman, will offer instructors practical advice on utilizing games as effective teaching tools, as well as some of the processes by which these teaching games are developed. Faculty, graduate students, and anyone else interested in incorporating games into their instruction are all welcome. See the attached flyer for additional details. Please forward this message to any lists or individuals you think might be interested.